Tony Tripp’s relationship with MTC dates back to 1975 when he began his tenure as our Resident Designer. Known for his exceptional eye for detail, over the years Tony’s imagination has brought to life the lush gardens of Heartbreak House, Emma Leech’s ’50s Carlton home in Summer of the Seventeenth Doll and the naturalistic back-porch in Proof. His sudden passing in 2003 was deeply felt throughout the Australian theatre community, but the ninety-odd designs he created for MTC during his 25 years with the Company live on in our memories, and in the Company archives which contains images, designs, models and props of Tony’s creation. And this year, we have the great pleasure of bringing one of those creations to life again. 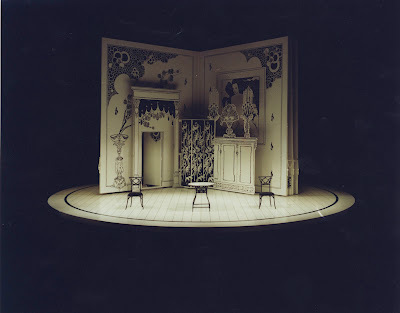 Perhaps one of the most distinctive features of MTC’s 1988 production of The Importance of Being Earnest was Tony’s pop-up-book set design with scene changes occurring seamlessly with the turning of a page. Charged with bringing this giant yet elegant book back to life is Richard Roberts, who shared the design studio with Tony for the best part of 14 years. When asked about the process of recreating the set, Richard explained that the original design was essentially a 3D cardboard model (which is now safely stored in the Arts Centre’s Performing Arts Museum collection). He had planned to either photograph or scan the pieces making the generation of new artwork relatively simple. Not so, as it turned out. “The model is actually quite fragile now, and putting it in a scanner was not an option,” Richard recalls. “Each of the three scenes is a complex collage of images taken from lots of different original drawings by Aubrey Beardsley, so the task became firstly sourcing the original images then identifying which elements Tony had used, and piecing them back together again”. With the help of one of our regular graphic designers, Kate Forehan, Richard went through the motions of scanning and collaging the designs and between them they generated the artwork for a new 1:25 scale model of the set. “I was often struck by the care with which each scene had been composed – they each have a visual balance that, like the structure, is deceptively simple, but in reality is finely tuned”. The 2011 version of the pop-up book model of the set for The Importance of Being Earnest.Tony’s original 1988 model is stored in the Art’s Centre’s Performing Arts Museum collection. Now to transfer the artwork to the full scale set. Should the artwork be painted by hand as it was originally or should they embrace digital technology – meaning the lines you would see on the set this time round would be those drawn by Beardsley, not merely the interpretation of a scenic artist? The latter was deemed appropriate and that’s what you will see on the stage. That, and the two tonnes of building material that are used to support it. One of Aubrey Beardsley’s original designs has been “drawn” onto the set as if by the artist himself, with the help of digital technology. Developing the mechanics of the set was an exercise in testing the memories of those who were at MTC the first time it was built, Richard says. “It’s a misleadingly simple-looking idea that has some quite complex structures behind it”. The full-scale set begins to take shape in our Workshop department. The hinges of the book’s ‘spine’ bear around two tonnes – making this ‘simple-looking’ set an incredible design feat by our production and workshop teams. So if you can divert your attention for a brief moment from the flurry of star crossed lovers, mistaken identities and Geoffrey Rush in a dress and wig, take a moment to observe the lovingly recreated pages between which the story is taking place.